It all begins with a proven formula. Sika Sarnafil has been using the same basic formulation in its membrane production process since its inception. Today, building owners are assured their roofing system will successfully perform for many, many years. Sika Sarnafil uses only the highest quality raw materials to produce its membranes. In the U.S., Sika Sarnafil produces Sarnafil and Sikaplan membranes. The Sarnafil G Membrane is a thermoplastic PVC roof membrane used in adhered systems. Formulated for long-term, direct exposure to the elements, this membrane is fiberglass reinforced, offering exceptional dimensional stability and a low coefficient of thermal expansion. By fully encapsulating the fiberglass reinforcement, there is no risk of delamination or water wicking. As well, a unique lacquer coating is applied to the top of the membrane which gives your roof a self cleaning feature that resists staining from airborne dirt and pollutants. 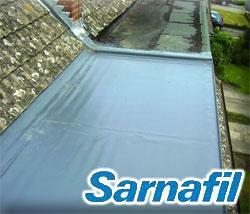 The Sarnafil S Membrane is a thermoplastic PVC roof membrane used in mechanically attached systems. This roof membrane is polyester reinforced, which provides the high breaking and tearing strength needed to prevent excessive elongation and sheet deformation under the stresses produced by the lifting of the membrane in this type of system. With four decades of proven performance history, our durable thermoplastic roofing membranes are the products of choice by architects, specifiers and building owners who want the peace of mind that comes with buying from the performance leader. Sikaplan is a single ply PVC roofing membrane designed for low-slope and steep slope roofing applications. The membrane has an internal polyester scrim reinforcement to provide the tear resistance required for mechanically-attached roof systems. Sikaplan is ideally suited for applications that require a quality, cost effective roofing membrane from a trusted supplier. The product has a successful track record of use on buildings in many parts of the world of more than 20 years. Sikaplan's white color reflects the sun's solar energy and helps to lower building cooling costs. The product meets the cool roofing requirements of USGBC's LEED program, Green Globes, ENERGY STAR and California Title 24. Like all Sika Sarnafil membranes, Sikaplan is thermoplastic; allowing seams and flashings to be hot-air welded using the Sarnamatic automatic hot air welder. When welded together, the sheets of membrane become one monolithic layer of material impervious to water and moisture infiltration.